On April 1st 2006, Dr. Glenn J. Morris; founder of the Hoshinroshiryu, passed on from this world. His contributions to the martial arts world will be remembered forever. 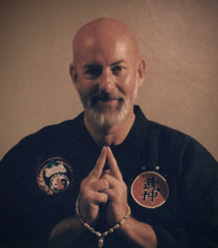 His teachings live on in the hearts and minds of his students and fans who read his books, followed his advice and explored his expression of the esoteric side of martial and healing arts. Hoshinjutsu, the physical side of his teachings started as an elective gym course at Hillsdale College in Michigan. Through continued study and training he was able to take eastern esoteric concepts and present them in a western perspective. In 1985 Dr. Morris experimented on himself using chinese chi kung practices, godai and hindu energy centers, along with focused visualizations to create a way of achieving a full, permanant kundalini awakening in himself. Over the next few decades he was able to replicate this method for his students and, using us as guinea pigs, perfected a very efficient and quick way to reach this awakening in 12 – 14 months. Glenn’s methods were so effective that he was named Grandmaster of the millennium for his ability to convey eastern esoteric concepts to westerners. The Hoshinbudoryu is dedicated to continuing the martial, meditative and healing methods that made Dr. Morris one of the most incredible martial artists to ever live. May his teachings live on forever!